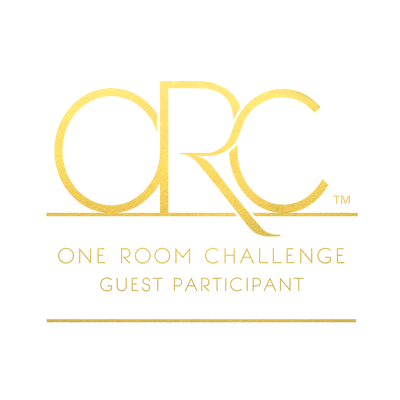 Welcome to Week 5 of One Room Challenge Fall 2017! It is hard to believe the makeover is almost done and for the first time ever, #ORC is extended for one extra week due to the natural disasters recently took place in North America. I am so sorry to hear about the weather related problems and delays experienced by my friends south of the border. On the up side, there is an extra week for us to share the behind the scene design / renovation progress before the grand reveal on Week 7! 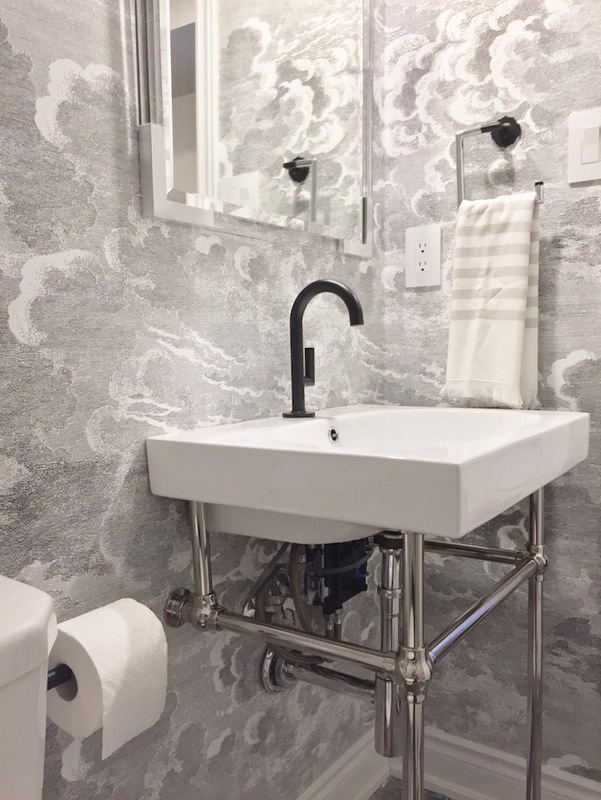 We continued to make great progress in the powder room. 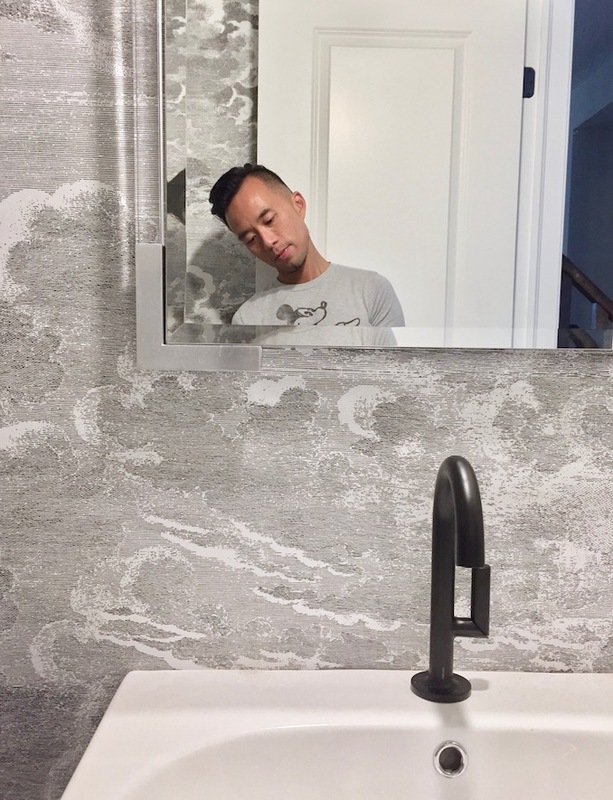 After putting up the most fabulous Nuvolette wallpaper from Cole and Son and the pendant from Tom Dixon, we are ready to put in the real jewelry in this room: the Brizo faucet and bathroom accessories from the Jason Wu collection. 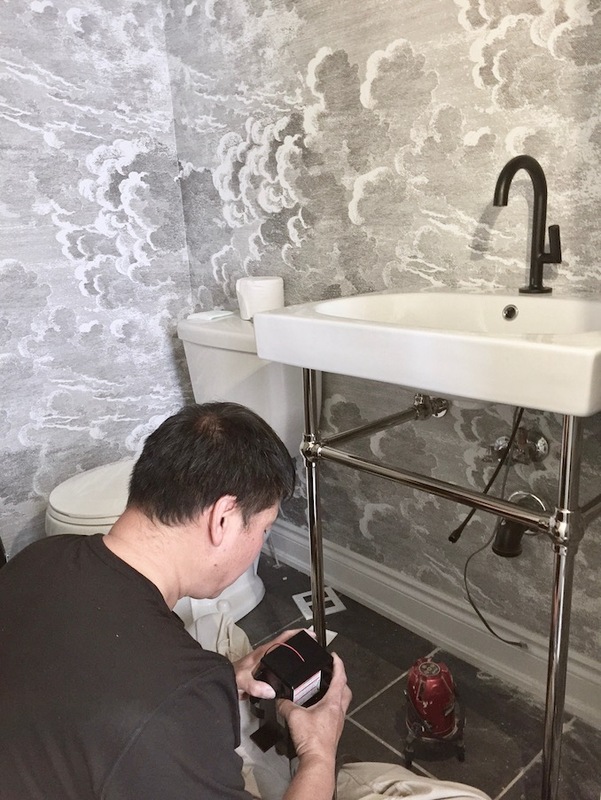 Our handyguy did his magic again with our plumbing situation and managed to tuck the technology component (SmartTouchPlus) neatly under the sink for a beautiful finished look. 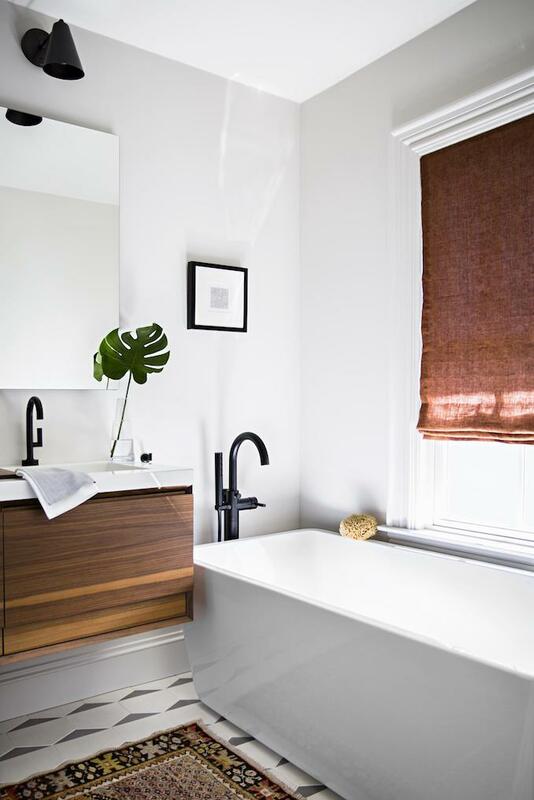 From sleek faucet to stunning bathroom accessories (LOVE the towel ring), I simply couldn't have enough of the collection. 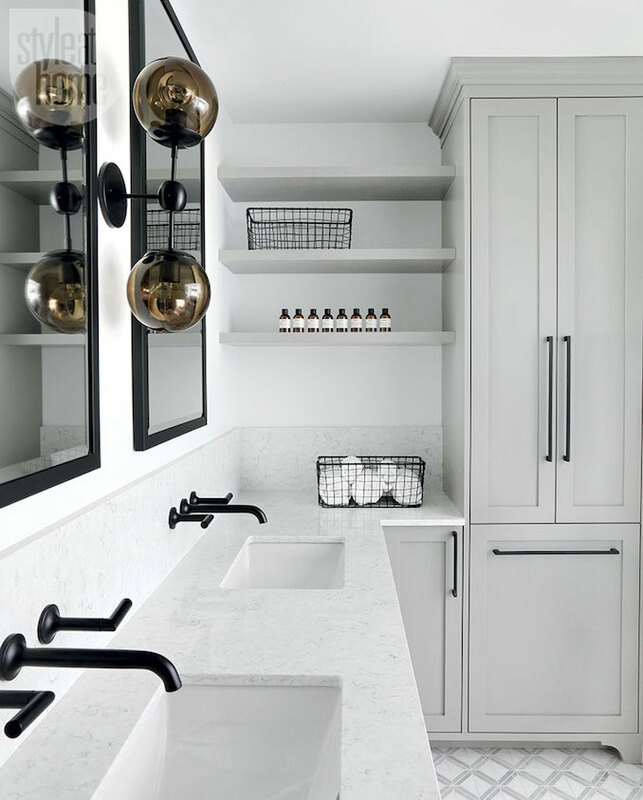 I have a feeling our guests may not want to leave this powder room! We also have my deal of the century lucite mirror hung and it is PERFECT in the space. Want to know where to find yours? 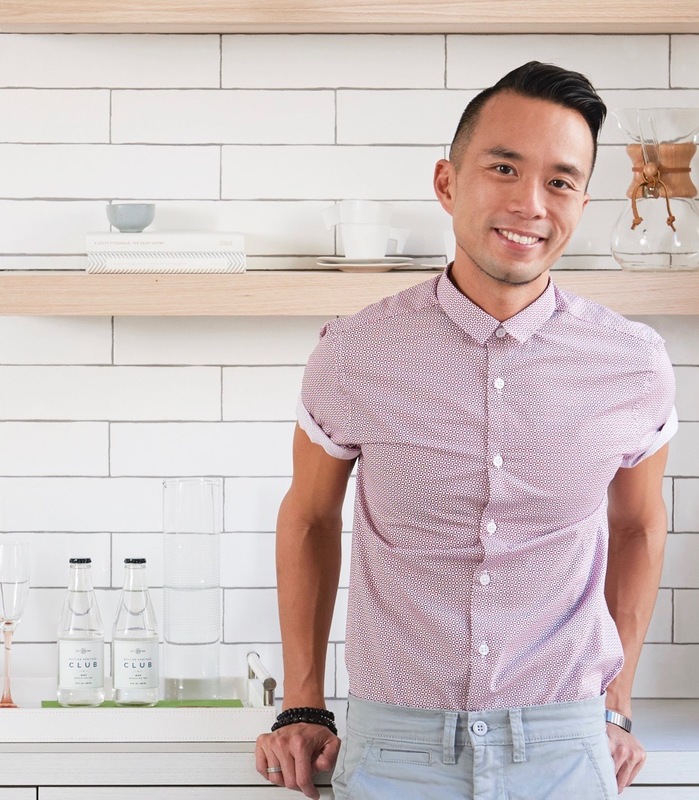 Run to your local HomeSense locations now! As for the guest bedroom, I am very happy to say everything is coming together beautifully in Week 5! 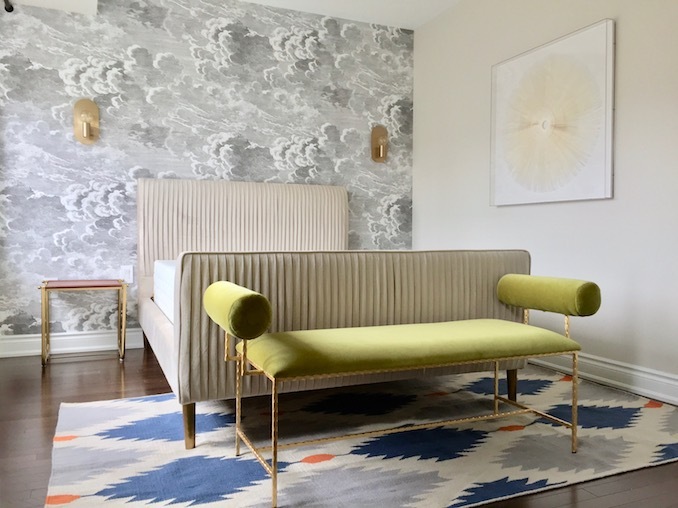 The major furniture pieces are in place, especially with our sensational pleated velvet bed from West Elm put together for one super elegant touch against our dynamite feature wall. I can't wait to put the finishing touches in this room, especially with mix of patterns and textures via fabrics. You won't want to miss the textile special next week! For now, I am absolutely thrilled with the sophistication and pops of drama we have achieved in Week 5. Be sure to check out the progress of the 20 featured designers and guest participants on #ORCFall2017 ... that's exactly where I am heading to right now! Tim!!!!! The paper is absolutely showstopping gorgeous. And all the fabulous dramatic elements. I am dying! thanks!! oh I simply couldn't say enough of how much I love that wallpaper. So glad you think so too! 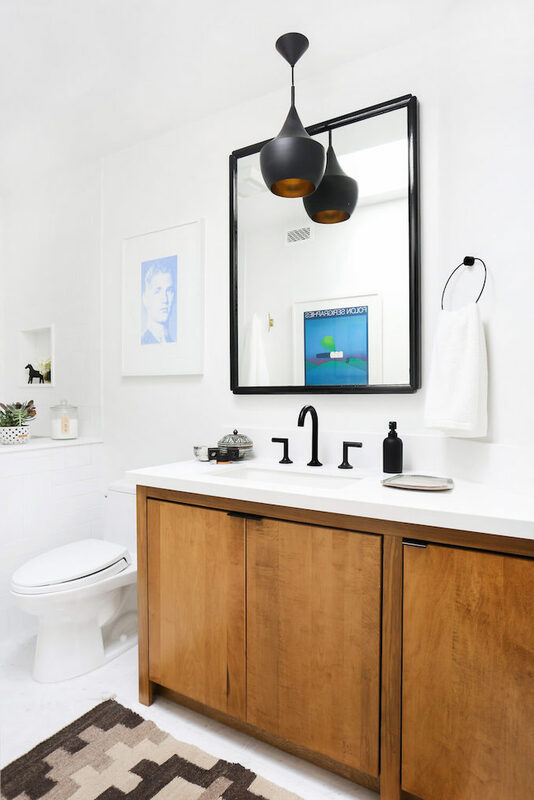 I LOVE, LOVE, LOVE everything about these spaces...the wallpaper, the fixtures. That bench at the foot of the bed... SA-woon! Great job! You are definitely nailing it! 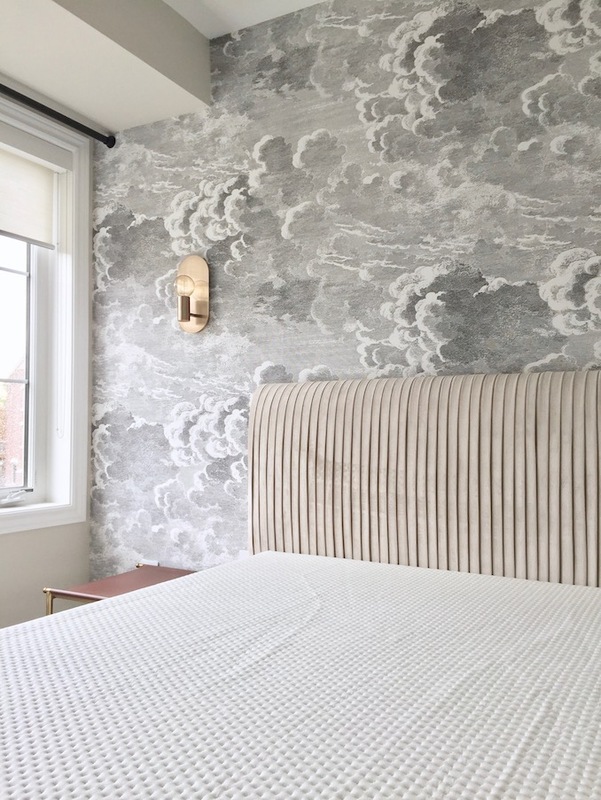 Love where this room is heading, and seriously LOVE that bed with the wallpaper and sconces! Well done! Thanks so much Suzanne! Yes I can't really pick an element I love the most as well. The paper is so impactful and the pleated velvet bed is just so luxurious, especially with the velvet bench with an intense pop of green! Wish it is my bedroom! I am so in love with this gorgeous bedroom and bathroom! It's so chic and elevated, I would most definitely not want to leave! There are so many gorgeous elements, I can't pick one, but that bed is really something! Looking forward to your pattern mixing next week! xoxo Tamara!! I couldn't agree more ... it's way better than the builder bedroom we started with a few weeks ago. 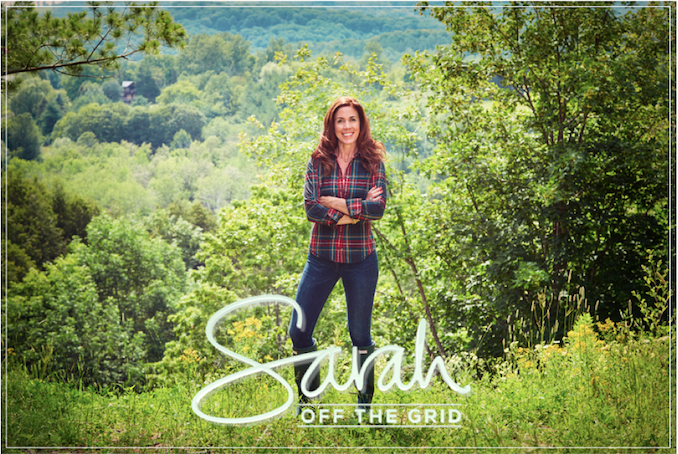 Love mixing patterns ... can't wait to share that next week! Love the channel tufted bed, wallpaper, and those scones! It's looking so amazing, Tim. it is indeed an amazing bed and i couldn't be happier. It was not that easy to get it to Canada but we made it! Wow, the wallpaper is gorgeous! Love it! Amazing that you are tackling two spaces, and killing it in both of them... Excited to see how they turn out!! What you have so far is amazing! TYTY Kristen! 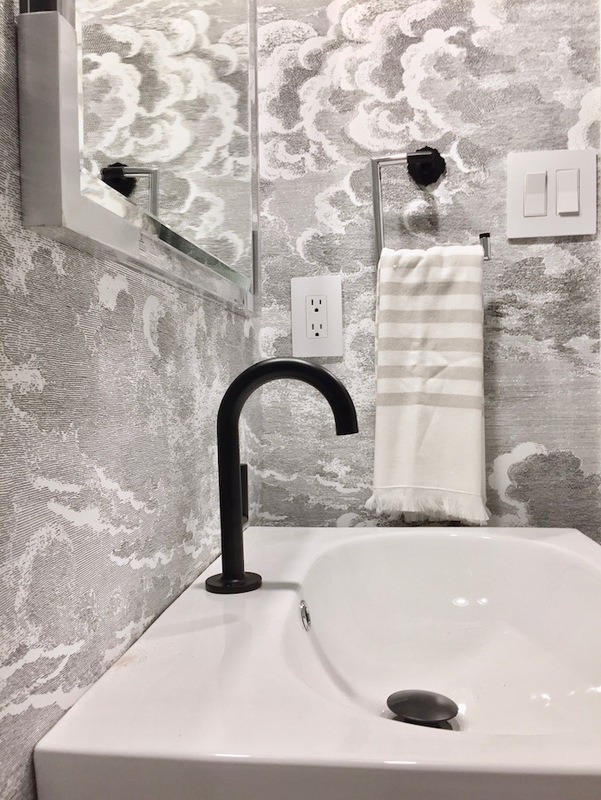 Love that the wallpaper is used in both spaces and I LOVED the different personality in both spaces! So happy to hear Erin! 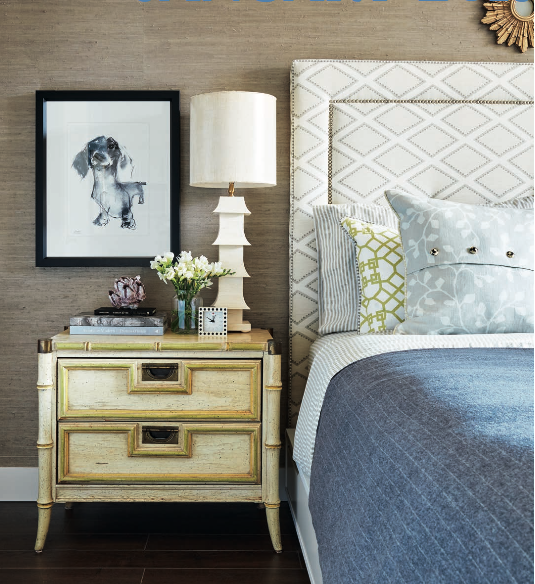 Love neutrals but yes I want more drama in this guest bedroom! this is fantastic!! I especially love the wallpaper and the green bench. just gorgeous! that pop of green is everything! thanks for stopping by Dana! Tim, You are so talented!! This room is fabulous and I love all of the choices that you have made. Your final reveal is going to be amazing. Thanks Sherry you are so sweet! I can't wait to share more on fabrics and artwork next week before wrapping the space up in Week 7! Everything is coming together so beautifully. I am just consistently inspired by your color/texture combos and how refreshing everything always looks. Can't wait to see the textiles next week! Thank You!!! 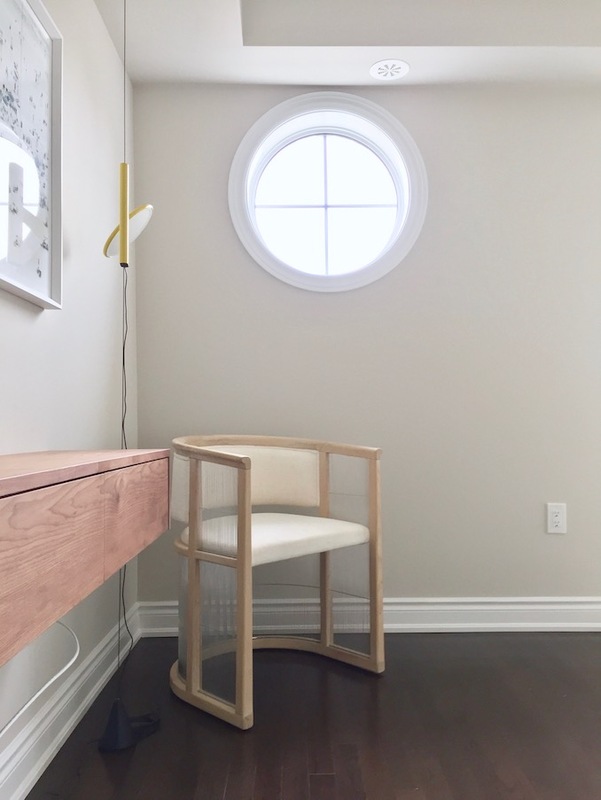 I am so thrilled that you love the space as much as I do as well! It has been a lot of fun and I can't wait to get it all done in 2 weeks! Tim, it's looking sooo good! 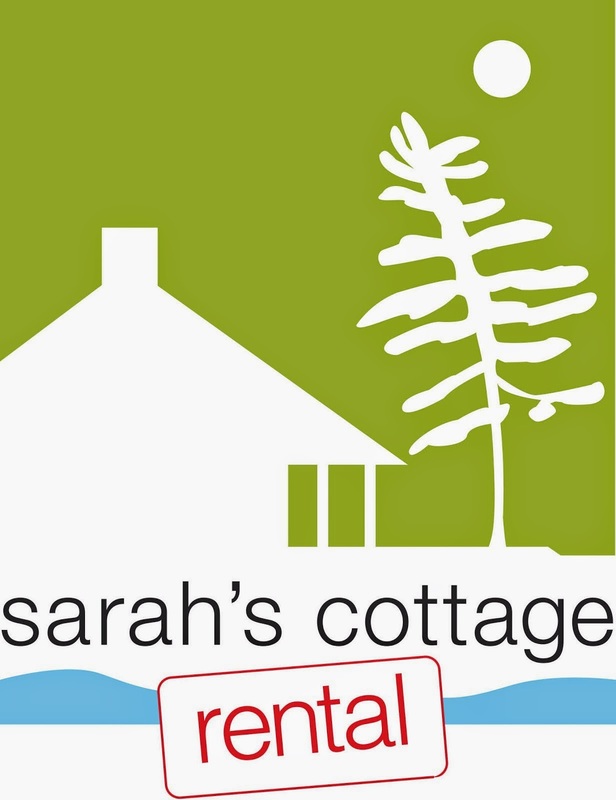 Love the tap, and I think you're right, your guests will never want to leave! Can't wait to see the rest. Thanks Dannyelle! I know I may just stay at my client's house forever!! OMG! I love the bed, this room for me is DONE! Aaaaaahhhh! Can't wait to see your final touches Tim! Thanks for the info on the Jason Wu line, didn't even know they existed! Fab! Thanks Vel!! yes that bed is divine and I would so recommend everyone to get it from West Elm before it's sold out! So much eye candy Tim... the velvet bed, that bench, the faucet, the towel ring... Everything looks truly amazing!!! XOXO Tana!! I so loving your powder room too! I’m a big fan of that wallpaper. 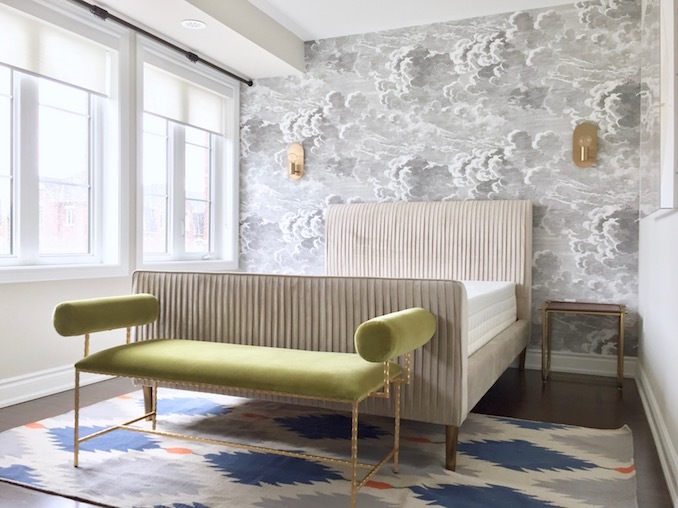 The bed, the sconces, rug—everything is so special. Can’t wait to see next week’s post! TYTY!! I couldn't be happier with how the room is coming together! Now I have to nail down the finishing touches! Hi Tim! 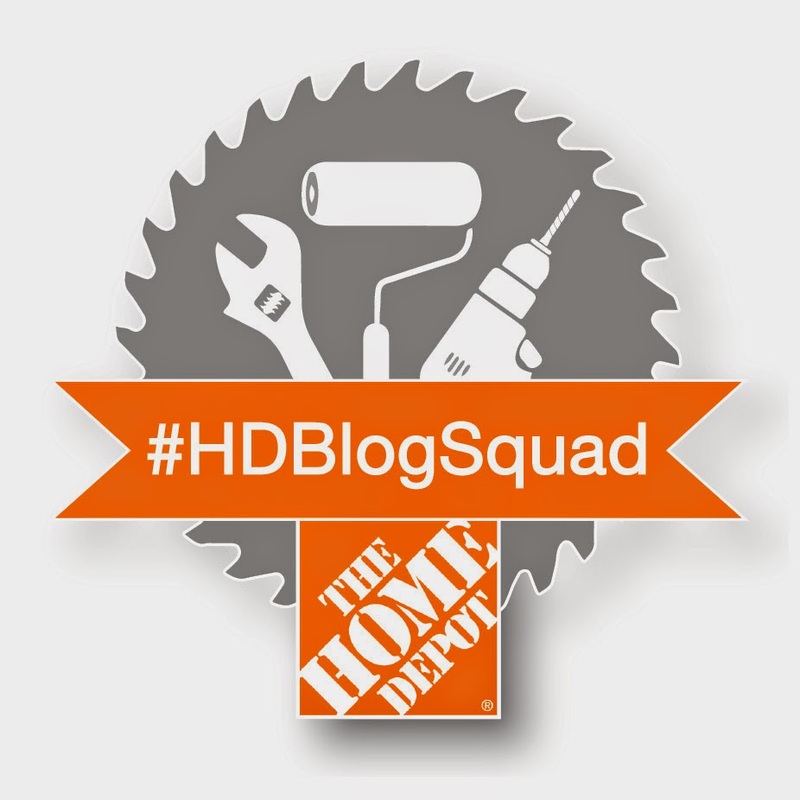 New subscriber to your blog! So happy to have found you through the ORC linkups. Your room is coming together beautifully. I cannot wait for your final reveal. You are on fire! I think this is going to be my favourite ORC that you have done. Can't wait to see it complete. oh Andrea you are so sweet!! Loving your office too and that door is AMAZING!! It all looks amazing Tim! 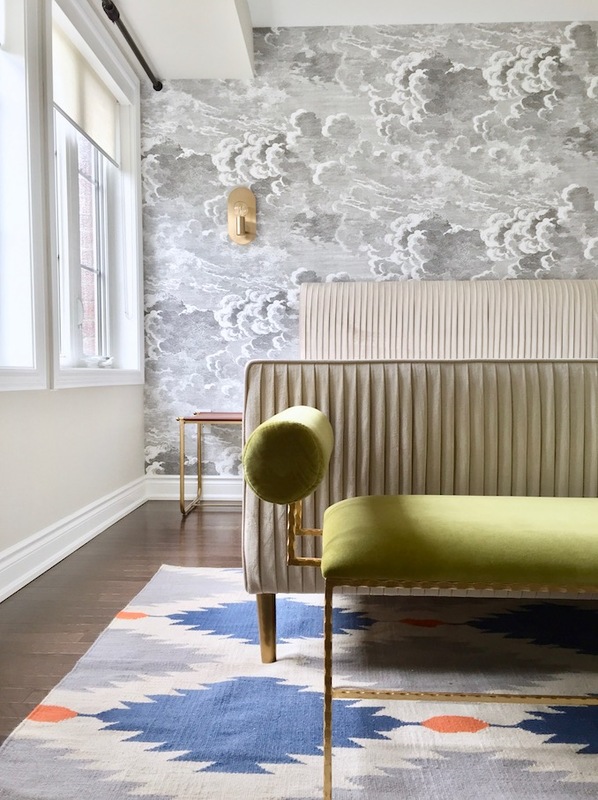 Crushing on the velvet bench and that amazing wallpaper!! The bedroom is so beautiful Tim - the wallpaper, bed and bench! Love it all together. And I can't believe that mirror is HomeSense - great find! pretty amazing finds at HomeSense and yes I couldn't resist and picked up two of the same mirror! One will be in my own house! Just checked out Tom Dixon; they have some neat items. 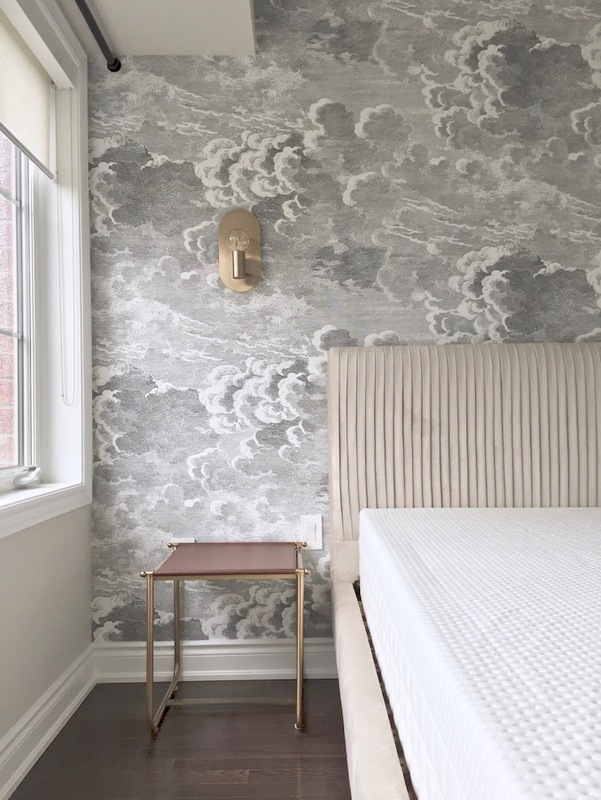 I love the wallpaper you chose, makes me want to try a wallpaper in my room. 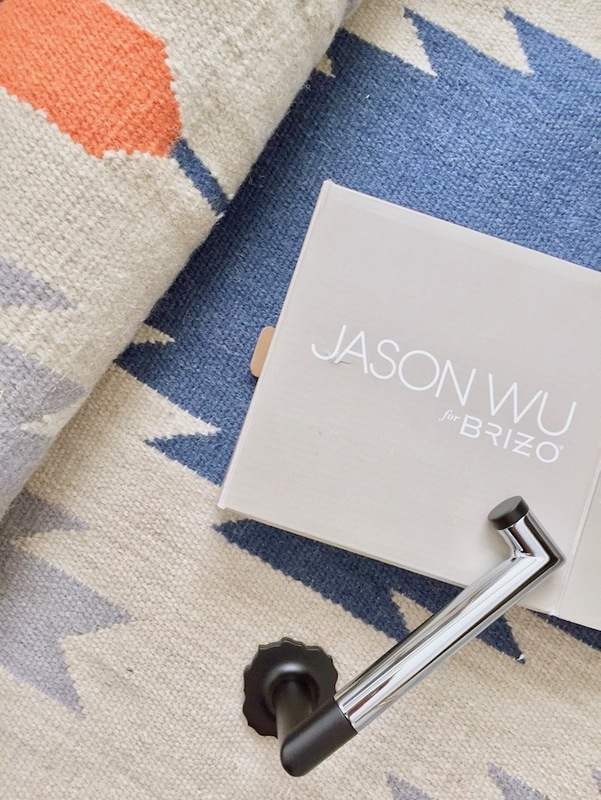 Love Tom Dixon and the Jason Wu collection from Brizo is a match made in heaven! All of this is incredible, I can't even handle it! You make it look so easy. TYTYTY Lee! It surely has been a lot of fun so far ... just 2 more weeks now! Daaaaaang that rug!!!! It ties the whole space together. Great work! Love the wallpaper too. Beautiful!!!! TYTY!! that rug is quite a statement and of course that wallpaper too! thanks for stopping by! I think I've scrolled through your photos 15 times - this transformation is amazing. You are a master at colour and print. Soo good!